Inflammatory Bowel diseases are characterized by relapsing-remitting inflammatory responses that have a tendency to develop where the bacterial load is greatest. Among industrialized countries, the increased incidence of Inflammatory Bowel diseases is presumably due to changes of the gut microbiota (herein referred as dysbiosis). It is indeed worth noting that Crohn’s disease recurrence is linked to a lower prevalence of major member of Firmicutes, including the anti-inflammatory commensal Faecalibacte-rium prausnitzii. More importantly, the intestinal microbiota has been highlighted to regulate intestinal homeostasis through the secretion of a large set of metabolites . Herein, genetically predisposed animals have been used to reveal the impact of two specific single gene mutations on the modulation of the metabolome within the colonic mucosa. Due to the complexity of colon tissue at the histological level and the importance of correlating meta-bolite distribution with specific location within tissue, the use of Mass Spectrometry Imaging (MSI) appears relevant to provide a better understanding of intestinal luminal meta-bolome. Our aim is to enhance the knowledge on intestinal metabolome thanks to in-situ analysis of metabolite profile and distribution within colon tissue models. The use of MSI enables a spatially resolved and unlabeled imaging of di+erent metabolites directly in their micro-envi-ronment and provides a molecular profile to specific histological substructures. – Animal: Terminal colons from Wild-Type and mutant mice were removed, snap frozen, embedded in CMC and stored at 80°C. – Sectioning: Colons embedded in CMC were sectioned following transversal plan (12 μm of thickness) using Microm HM560 cryostat (Thermo Scientific, Germany) at -20°C and mounted on ITO conductive glass slides (Delta Technology, USA). 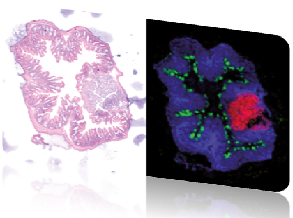 HE Staining was performed on adjacent tissue sections for better visualization of histological regions. – Matrix: 2.5 DHB powder (150 mg) was used and vaporized on tissue sample using home built sublimation apparatus (150°C, 8 min, 2.10-3mbar). – Mass spectrometry imaging: Autoflex Speed LRF MALDI-TOF (Bruker Daltonik, Germany) with SmartBeam II laser. Positive mode (100-1000 Da) at 20 μm spatial resolution. – Software: All presented MS images are from MutltimagingTM software 1.1 (ImaBiotech, France). filter) m/z 703.59 (blue filter) cannot be accurately identified. on an overlay molecular image from coronal section. mucosa, villi & crypts of Lieberkühn. to the pathogenesis of chronic inflammatory bowel disease . – Matrix: 9AA (10mg/ml, Methanol) was chosen and deposited using TLC sprayer (Sigma Aldrich, Germany). – Mass spectrometry imaging: Solarix 7.0T FTICR (Bruker Daltonik, Germany) with SmartBeam II laser. Positive fullscan mode (100-800 Da), 300 shots at 40 μm spatial resolution. – Software: All presented MS images are from MultimagingTM software 1.1 (ImaBiotech, France). function and its role in the development of CD and/or GVHD. or highly disease relevant tissue (as for example Peyer’s patches or crypts of Lieberkühn). High spatial resolution molecular imaging allows following molecules/metabolites at the cellular level (such as Paneth or goblet cells, which are related to the development of several gastrointestinal diseases).